I’m working on this piece, and I’m just not in love with it. It’s not that I don’t like it, but I’m just not enchanted with it. I usually fall in love with a quilt once the piecing is almost done, and as I near completion on this quilt top, I find myself says… Meh. It’s nice and all, it really is, but I’m just not all that thrilled with it. I’m kind of tossing around the idea of what to do with a border, and I’m just not sure what to do about it. It’s so hard to complete a project when you fall out of love with it, eventually you can even start to actively dislike it. I’m new to quilting but I know this from my needlepoint/cross-stitch experience, and the number of unfinished projects that I have in cupboards, things that I once thought I loved and just had to do. I know what you mean. I’ve been actively trying to avoid it all day. I just don;t know what to do! Think of what you will quilt it with, How about a lime green thread? add some embellishment, make it a wowser project of your choosing, how about some fusible bright fall leaves? It happens. Even those of us who have been quilting for 37 years still make “meh” quilts…lol. I’ve learned to enjoy the process and realize that not every quilt I make will be award winning or one that I’m just overjoyed with. I enjoy the process and know that I’m learning something. Sometimes the best thing is to put it away for a while, work on something else, then BAM…an idea will hit you and you’ll pull it back out and finish it to your liking. When I saw the picture I thought this was an aerial view of Midwestern farm land. Maybe that would inspire something? It might be the drab, sad color combination. But that is likely just me. I’m the one who puts BRIGHT COLOR into every quilt I make. I agree with adding a bright color. Maybe a bright version of the blue that’s in the quilt (well, it appears to be blue). Maybe just some skinny long lines integrated into the piecing. Good luck. I look forward to seeing your solution! Its not a drab, sad color combination. Not everyone likes bright fun-house, circus colors. I like the color combination, that being said why not cut it apart and add some pops of light gray? Finish it up and give it to someone you dont see often. I think it’s the big squares of solid (or reads as solid) brown. They’re just too big and they bleed into the three-stripe block. I think maybe something in the same color family as the light in the nine-patch would help break it up. I thinks it’s lovely. It looks small, from the photos. A dark border would enclose it more, a darker brown with a little bit going on in the fabric. If it bugs you too much tho, put it away until fall. Take it out again in late September and see if you feel the same. If so, just let it go until something else comes to you. I am not a quilter per say, (at least not in several years) but I am a crafter of all sorts of items, designs, styles, etc. As I Iook at your Magnificent piece, I feel that the big Solid & Print Brown squares are what give the illusion of emptiness. 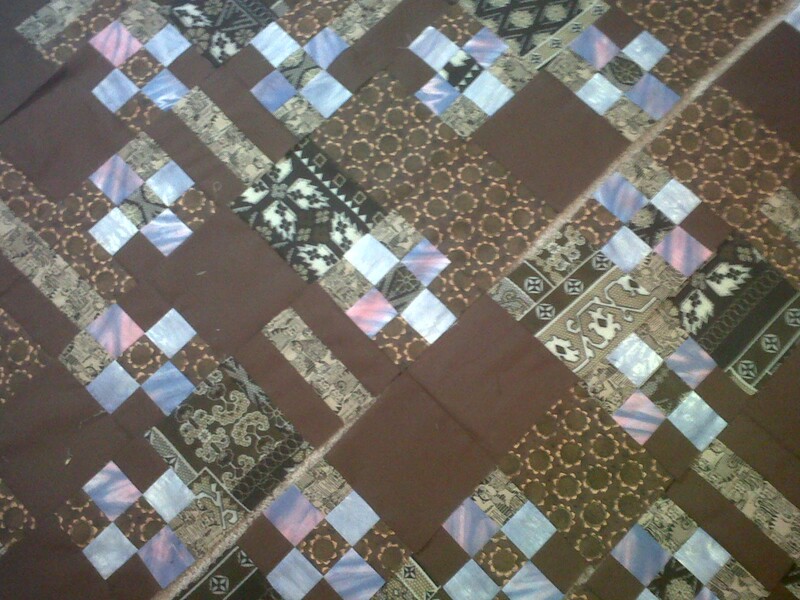 What if you add a small square piece in each center of the lighter color that you used throughout the quilt. It looks like it is blinged. That may balance it out with color. Keeping it simple, but balanced. Just a suggestion. Hope it helps.